BodySpace is the world's largest fitness-related social media site. Each month we scour its pages to find the best of the best. Want on this list? Make BodySpace part of your world. This is a story of one man's growth, but it's also the story of every man who makes the choice to change. It chronicles athleticism that was gained through a decade in the gym. Bodies like this aren't instant prizes at the bottom of cereal boxes; they are more like retirement gifts-retirement from the loose life of junkfood and flat muscles. The physically fit stars of the entertainment world used to taunt Pham Vu with their sculpted appearances. But when he took a friend's advice and began his own fit career, he discovered the physical potential that had been locked away inside him. We congratulate you, keepittite04, as the August BodySpace Member of the Month! Choosing to lead a fit and healthy lifestyle has been one of the best decisions I have made in my life. or effort to making it happen. I decided right there and then that was what I wanted. So I am grateful to my friend Thanh (lilthanh19), who introduced me to the world of bodybuilding. Bodybuilding has saved me from a lot negatives in my life. I now live a more organized, healthy and meaningful life because of it and I will always be thankful for it. I stumbled onto BodySpace one day while searching for supplements on Bodybuilding.com. I always enjoy reading the features on members who turned their life around through fitness, and especially the members who were overweight. This is a huge problem we're fighting in this country. Shoulders, shoulders, shoulders! Definitely my favorite exercise. You've been on BodySpace for a long time. How do you stay motivated for the long term? Seeing all the amazing profiles on BodySpace has definitely made an impact on my lifting. Ultimately, motivation for me has come from within. I get a lot of people asking me how I do it, and I always tell them, "The three D's are what got me there. Discipline, drive, and dedication will get you where you want to be." One of my biggest mistakes when I first started bodybuilding was rushing to buy a million different supplements that I thought would magically make me huge. After wasting God knows how much money, I finally learned that the only way to maximize your gains with supplements is with a good exercise regimen and proper nutrition. Don't rush in and buy everything you read about in a magazine. Get some experience under your belt, figure out where you are lacking and need improvement, and go from there. Casein protein is a supplement that has really worked for me. The slow-digesting protein feeds my muscles through the night and keeps them from going into a catabolic state. I take this mainly at night and I wake up with my muscles feeling much fuller than if I was without it. A variety of training routines, proper nutrition, supplementation, and an adequate amount of sleep are all equally important in achieving optimum muscle growth and recovery. It is so easy to get comfortable with doing the same exercise over and over, but we need to remember to keep changing up our routines to keep our muscles from adapting, and keep them growing. Proper nutrition will help fuel, feed, and repair muscles you work every day. Make sure to eat an efficient amount of protein, carbs, and healthy fats every three hours to maximize your gains. After trashing your muscles with an intense workout, refuel with the proper nutrients and rest those muscles with eight hours of sleep every night. Muscles need that time to rest and recover. The only kind of tunes coming out of the iPod during my workouts is rock! First song on my playlist is "Down With The Sickness" by Disturbed. Every time that song comes on, it gets me in the zone and I know it's time to go to work! If you are looking for motivation, this is the place to be. Greatness can come from being a part of a group of so many people with the same passion as you. One of my goals is to be featured in a magazine one day. BodySpace has gotten me closer to that goal in many ways. I've met so many amazing people there who have given me so much inspiration and drive to be bigger and better every day. Thanks for all the motivational comments, and I hope to keep inspiring you guys to keep pushing yourselves to the limit! Has BodySpace changed much since you joined? BodySpace is growing everyday with new faces and new ideas. It has everything we need to keep growing and getting bigger and better every day. 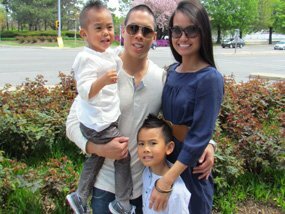 I want to thank my wife Lian and my two sons Jason and Jaden for supporting me with my bodybuilding 365 days each year. It is difficult to juggle a busy workday, grueling fitness and eating schedule, and family life, and I couldn't have done it without them supporting me 100 percent. How can you fans find you on other social media? This is the only social network for me!